Udupi, July 31 2016: Speaking after inaugurating three lorries for collection of garbage on the premises of the Udupi CMC, City Municipal Council. 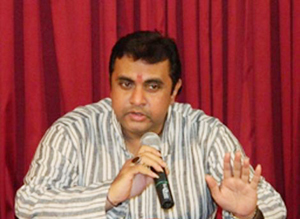 Pramod Madhwaraj, Minister of State for Fisheries, Youth Services and Sports, on July 30, Saturday stressed on the need for better disposal of garbage in Udupi city. Minister Madhwaraj said that these lorries would collect garbage from Badagabettu, Kalmady and Moodabettu wards. In the next phase, more such lorries would be purchased, he said. D. Manjunathaiah, CMC Commissioner, said that the services of the 32 newly appointed civic workers would be engaged to keep the city clean. Priority was being given to collection of garbage at source in 63 multi-storeyed buildings in the city. Awareness would be created on composting garbage and using it as manure to the gardens in these multi-storey buildings.